What is distributed computing? Distributed (or grid) computing is a method of breaking up very large computations into smaller parts, which are then distributed across a local network or the Internet to other computers. By using this approach, a DCP project can do complex calculations with minimal overhead, as they only have to maintain a central server that distributes the work to client computers that are provided by volunteers. These computers can be anywhere around the world (or beyond! ), as long as they have access to the Internet. The use for DCP can be everything from analyzing the terrabytes of data collected from radiotelescopes, rendering 3D animations, searching for molecules that could help cure diseases, or to test engingeering structures in a multitude of environments. Grid computing is similar to cluster computing (like the renderfarms used by DreamWorks and Pixar), but instead of using a cluster of identical nodes that are expensive to purchase, run and maintain, each "node" is a regular computer volunteered to work on the project by its owner. Why DCP? DCP is designed to be unobtrusive to the user, aside from the client software and maybe a screensaver (depending on the project) that gives you information about the project's progress, and to look cool. Even when you are using your computer for intense applications, it is very rarely using all of its computational power. DCP projects use this spare computational power to do their calculations, all on a volunteer basis. Since there are millions of computers around the world and new ones come into use every day, the potential computing power that exists worldwide is immense. DCP projects aim to try and make some of this useable for a greater purpose. It can also reduce the monetary and energy constraints on an organization, reduce the ammount of new technology an organization has to buy, and keep technology out of the landfill by reducing the need to continually upgrade in order to complete work faster. DCP especially makes sense in home and office computing applications, where cutting-edge technology is purchased to do the same word processing and Internet work that much older computers can do just as efficiently--the extra computing power is used for a DCP project, and not wasted. Why BOINC? I use BOINC (Berkeley Open Infrastructure for Network Computing), because it is a public platform using open-source software. Thus, anyone can create a public or private BOINC project, and then use the BOINC client and server software to complete work distributed among many client computers. There is also a lot of support for BOINC and the projects making use of it in the community, and it is very easy to use. How can I start with DCP? All you have to do is download and install the BOINC software, and sign up for one or more projects. Each project will provide you with the necessary information to sign up and get your computer crunching workunits. Or, you can use an account manager like BAM!, that will allow you to sign up for multiple projects and manage multiple client computers from one website. Visit a project or account manager website, and follow the instructions to sign up. Does it use a lot of bandwidth? BOINC has a lot of configuration options, that allow you to choose how often the BOINC client connects to the Internet, and how much work is stored in its queue. 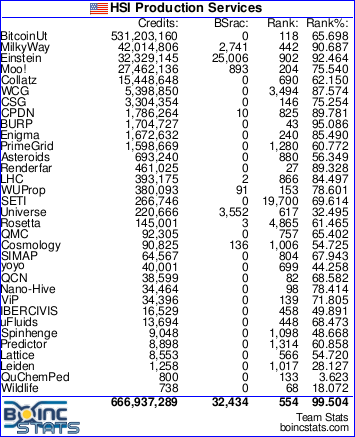 You can use BOINC even if you are still using a modem, or only use your computer occasionally. How can I track what I've done? Different projects have different goals and outcomes, but all BOINC projects assign credit to hosts in the unit of a cobblestone, which is awarded by a project for work completed. Each project can provide you with detailed stats on the work you've done, or you can use a stats site to track multiple projects, such as BOINCstats. If you have any questions about BOINC, DCP or the various projects, you can visit any of the links I've posted for more information. Most projects and other community website have forums where you can ask questions, offer suggestion, or just talk DCP. Previous Projects: Projects that I am no longer participating in, but are still active. Spinhenge@Home (Windows/Linux): Help develop magnetic particles for use in various nanotechnology applications. Retired Projects: Projects that are no longer active. OS X 10.5.6 6.10.43 Stolen 7/17/10! Names link to their user stats page at BOINCstats.